We are involved in presenting an exclusive range of Press Tool Design Training Services. Offered array of services is rendered using best quality materials by our professionals with the help of new technology. These services are admired due to its reliability and timely execution. We are engaged in designing Press Tool for any kind of component / manufacturing activity. With our advanced techniques, we are able to provide total design solutions to the customers. Progressive Tool Design is the key factor for the high volume production on continuous basis for all the sheet metal components. Kedage Precisions has manufactured a wide range of Progressive Tools for complex parts with dimensionally & functionally critical components. Metal Stamping is the process of talking blank sheet metal of various thickness and material, and reforming it into different shapes using different operations. 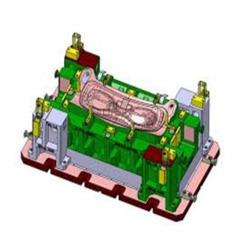 Kumar Solutions tool engineers are experts in metal stamping and tool design of various parts from smallest electronic design to large automotive parts. We provide 2d and 3d cad design for press tool. according to the component. We provide Press Tools Designing Services to our patrons at nominal costs. This service is enormously admired by patrons owing to their stress-free completion and reliability. These services are rendered by industry capable professionals who work in proficient way to render this service within prearranged time frame.